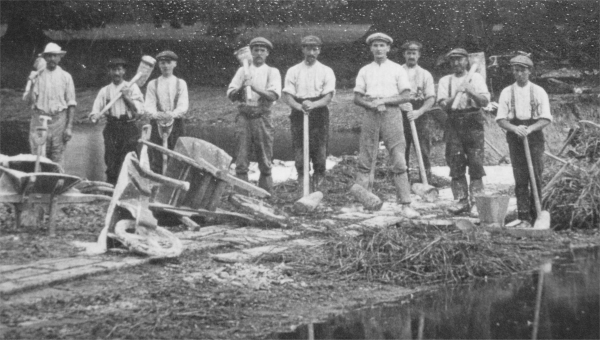 The Smith family, of Market Lavington were dew pond diggers by trade. The family passed the skills from generation to generation and prepared ponds over a period of at least 160 years, starting in about 1780. Sybil Perry, former pupil and teacher at Market Lavington School descended from the Smith family and sent us a tape explaining the art and science of pond digging and the reasons why they had to be dug. Chalk land suffers disadvantages when it comes to crop growing in that the soil, which is able to support a wealth of flowering plants, is rather impoverished when it comes to fattening up heads of wheat or barley. It needs fertilising and the time honoured way of doing this was to have sheep grazing on the open down during the day and then penning them in a small area overnight. The sheep produced dung which, effectively, added nutrients to the required area. Next day, when the sheep were out on the downs, the shepherd would move the hurdles so that a new area was treated the next night. It was quite labour intensive, but simple and effective. But there was another snag in that chalk is a porous material and does not hold water. Sheep can’t live without this vital liquid. That was where the pond diggers came in. They had the skills to produce a tough layer that would hold water – mostly rain water – so that sheep could get a drink. Dew ponds (a misnomer really) were vital to all of the agriculture on chalk downland, like Salisbury Plain. For much of the south of England, if you needed a pond, you called in the Smiths. 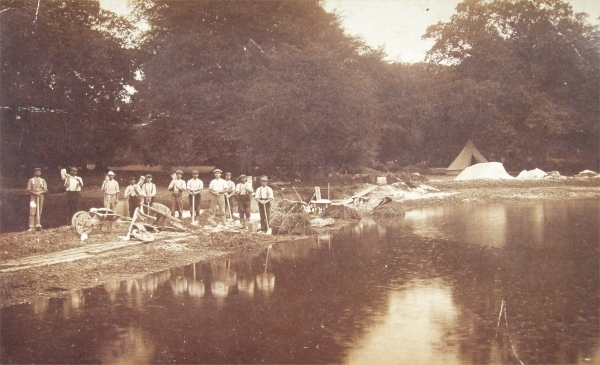 Our picture shows the team at work, probably in the Basingstoke area. It is thought to be early 20th century. The diggers would have lived on site whilst digging. No doubt the tent provided the required shelter. Let’s have a look at the people. We can see that they had basic hand tools – spades and large wooden hammers used to help puddle the surface to make it water-tight. Mr and Mrs Charles Smith, who lived at Broadwell House, feature in a display at the museum this year. This entry was posted on June 22, 2011 at 5:22 am and is filed under Museum. You can follow any responses to this entry through the RSS 2.0 feed. You can leave a response, or trackback from your own site.